The other day I was delighted to discover this handmade doll wardrobe from someone who commented on the blog and sent in an email. Arin from A Piece of Life's Pie and her husband made some one of a kind special doll wardrobes for their daughters' and we love how they turned out and just had to share! I can't tell you how much I love the little area where the dolls can primp and look in the mirror...so clever and cute! To see more close-up photos of this project as well as learn more about Arin be sure to take some time to visit her blog. 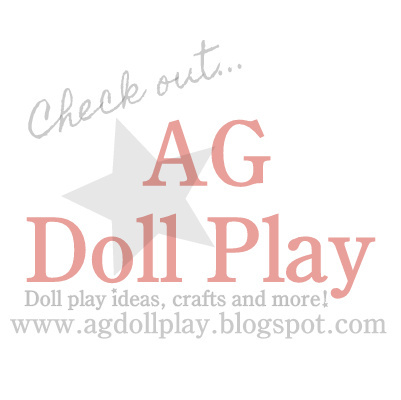 Thank you so much Arin for sharing this amazing project with us at AG Doll Play! THANK YOU Arin!! Wow, what a fun project...we love it! Wow! That is one AWESOME doll closet!I love the mirror area- how it closes and everything! The painted birds were just way too cute! I agree...it's a great design! Thanks for commenting! I love how it is so compact! Me too, great idea for people that can't keep things like that opened up and out.